This sums up speargun technology, quality and innovation. The 28mm aluminum barrel is overcoated with a layer of polyurethane foam, giving a cuttlefish bone shape with full and perfect balance.The barrel is fitted with the patented Quick Tilting (TRB) Head made of a polyamide resin. 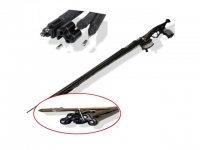 The TRB head provides excellent tracking and a smooth swing, preventing the buckle any warp of the barrel, as it has the rubbers diagonal to the vertical axis of the gun. It also allows for the rapid replacement or interchange of rubber, either 16 or 20mm, without using any tool, ease of removal for refrigerated storage or changing from single to double rubber option, using the KATYUSHA Head. • 17.4 ph stainless 6.5mm Australian shaft with 3 shark fins. This Product was added to our catalogue on Tuesday, 02. August 2011.